Mayo Historical & Archaeological Society in association with the Heritage Department of GMIT is holding a talk on the Wild Nephin Wilderness Projecct in GMIT, Castlebar on Wednesday 6th December at 8pm. In his presentation John will define the concept of Rewilding and related subjects such as wilderness, ecological restoration, self-willed land and novel ecosystems. Using examples from around the world where rewilding has been practised, a case will be made for an approach to the proposed rewilding of the area now known as Wild Nephin or Néifinn Fhiáin in the Nephinbeg mountain range. A native of Westport, John currently lives in Ennis where he worked as an Industrial Chemist for a number of years. An avid hill-walker, John leads walks for the Clare Outdoor Club and was a member of the board of Mountaineering Ireland. A passion for the wilder parts of West Mayo led him to research the contentious concept of rewilding and formulate some ideas on the future of the Wild Nephin project. The groups looks forward to seeing you there, for what promises to be a most interesting presentation – particularly in light of the recent announcement that the Nephin Wilderness Park is soon to officially become part of Ballycroy National Park, thereby expanding the national park to 15,000 hectares, one of the largest in Ireland. For more information on this talk, email Gearóidín Ní Ghrúínéil at groonellgeraldine@eircom.net or call 086 8705971. 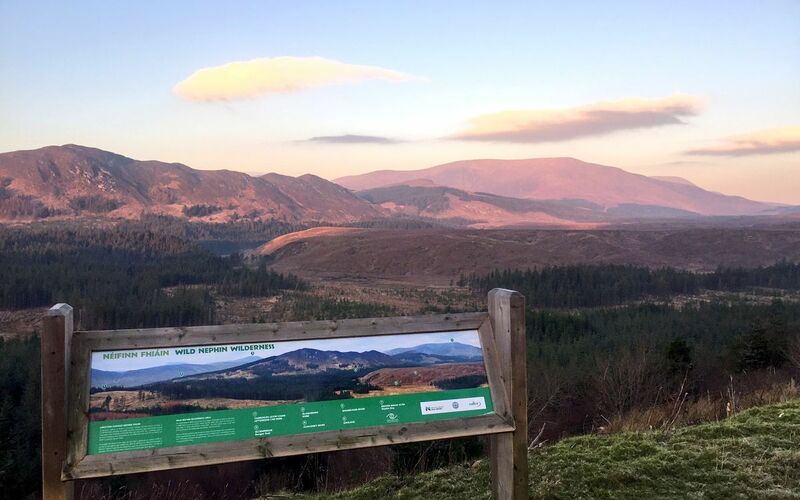 For more information on the Wild Nephin Wilderness initiative visit Wild Nephin Ballycroy National Park.